Although remembered as the mother of modern nursing, Nightingale was an accomplished statistician too. She was particularly innovative in presenting data visually. The example above, of a type now known as “Nightingale’s Rose” or “Nightingale’s Coxcomb”, comes from her monograph, “Notes on matters affecting the health, efficiency and hospital administration of the British army” published in 1858. In the same year she became the first female fellow of the Statistical Society of London (now Royal Statistical Society). 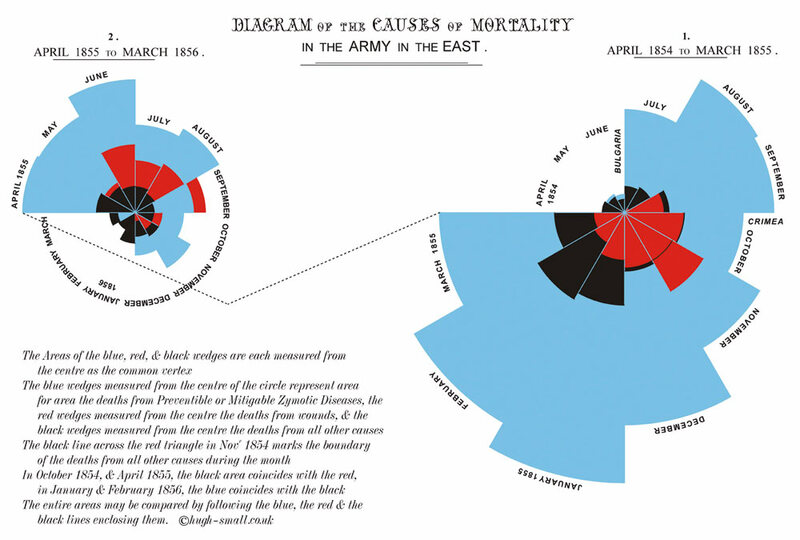 The chart displays the causes of the deaths of soldiers during the Crimean war, divided into three categories: “Preventible or Mitigable Zymotic Diseases” (infectious diseases, including cholera and dysentery, coloured in blue), “wounds” (red) and “all other causes” (black). As with today’s pie charts, the area of each wedge is proportional to the figure it stands for, but it is the radius of each slice (the distance from the common centre to the outer edge) rather than the angle that is altered to achieve this. Her principal message—that even during periods of heavy fighting, such as November 1854, far more soldiers died from infection than from wounds—can be seen at a glance. She sent the chart to the War Office; and it is a fair assumption that it contributed to the improvements in military hospitals that she brought about. Nightingale’s chart is a beautiful and persuasive call to action, but it is not perfect. The red, black and blue wedges are all measured from the centre, so some areas mask parts of others. The numbers of deaths from the various causes are not stated—although, to be fair, it was their relative size that Nightingale wished to show. Coming from America, I have always associated the police with a kind of bullying menace. Although I have seen many old films and TV shows featuring pudgy, gregarious, community policemen, I came of age in 80s & 90s, which was an era of aggro, steroid-fueled pigs of the Dirty Harry, Death Wish variety. 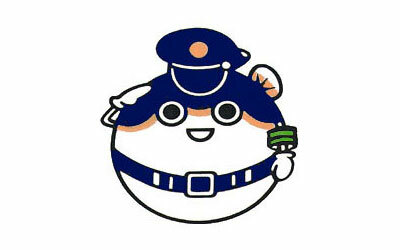 So upon moving to Japan after college I found it kind of shocking that the police there seem to go out their way to promote a friendly, non-threatening image to their citizens. 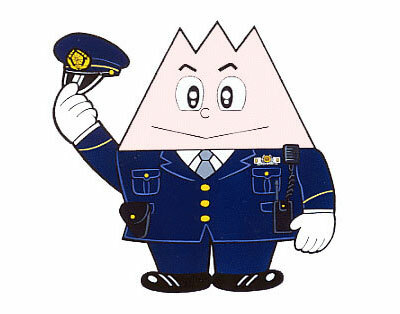 I was reminded of this today when I stumbled onto this fantastic collection of Japanese police mascots collected by Edward Harrison. As a kind of disclaimer I should probably say that once you’ve broken Japanese law (or scared a Japanese person) and the police have you at the station, I think things change pretty drastically. 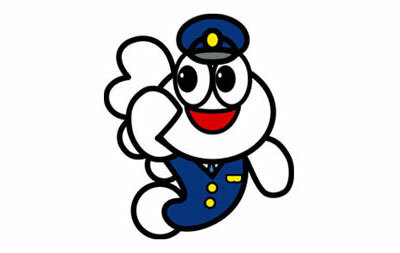 And there is of course an Orwellian aspect to the kawaiification of authority, but still my impression and experience of Japanese police is that their default setting is friendly. The bird symbol of Aichi is of course an owl, a Eurasian scops-owl to be precise which is called ‘konohazuku’ in Japanese. The migratory bird is found throughout Europe, Asia, and the Americas. Shinshiro in Aichi is a famous spot where the calls of the owls can be heard. 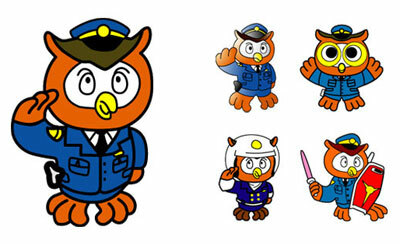 So the first part of the name comes from the type of owl while the later, ‘keibu’ means police inspector. Kagawa’s capital city, Takamatsu, was the location for an historic battle between the Heike and Genji clans. Nasu no Yoichi was a famed samurai who fought in the Genpei War and known for his skilled archery. An enemy of his side is known to have placed a fan at the top of a mast on one of his ships, and challenged the opposing side to shoot it off. Despite the fierce waves and the rocking of the ship, Yoichi hit the fan with just one shot. 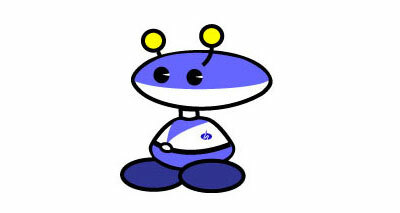 The bright and colourful mascot takes inspiration from this historical figure. On the 11th of November 1999 Gorou-kun was born and started working in public relation campaigns and traffic safety classes for the police. ‘Mutsugorou’ is the Japanese word for mudskipper and where Gorou-kun takes his name. The wide eyed mudskipper a creature common on the coast line of saga represents the police forces friendliness, their sense of justice and cheerfulness. 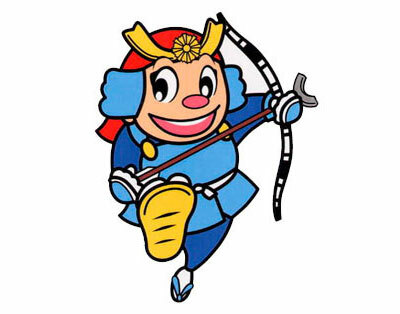 Tateyama was designed by Fujiko Fujio the penname for two manga artists called Hiroshi Fujimoto and Moto Abiko. They are most famous for creating Doraemon and Obake no Q-taro. 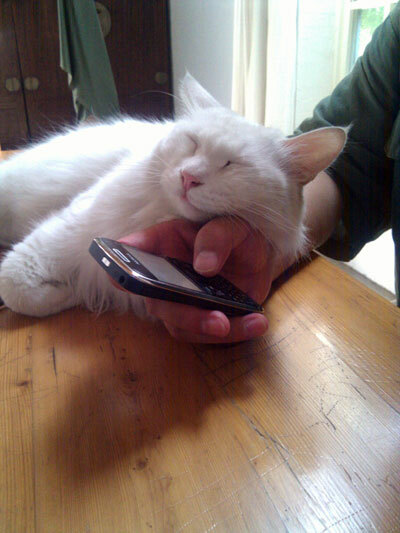 Both artists came from Toyama but moved to Tokyo for work. The design and name of the character comes from Mount Tate (Tateyama) one of the tallest peaks in the Hida Mountains. Here’s a little interview I did with Ai Weiwei for the November/December issue of Flash Art magazine. In stores now, pick it up. Your installation for the Unilever Commission recently opened at the Tate Turbine Hall in London. That seems to me a very difficult commission, not just because of the prominence of the institution and quality of past recipients, but due to the character of the Turbine Hall itself. How did these aspects affect you? As you say, the Unilever Commission is a program that’s been running. I’m already the eleventh person invited by the Tate to do this. Of course, you see that those artists go in very different directions in terms of their personal histories, their artistic statements, and their public performance. This is important, because the Unilever Commission really is a public performance, since it’s in a public space that attracts a few million visitors and a lot of media attention. I felt that the work had to have some kind of relation to that condition. It could be a very minimal relation, but still you need to decide what kind of position you want to take. You’re not really trying to prove something to yourself or to challenge, but rather to speak very quietly but certainly about certain elements of life.